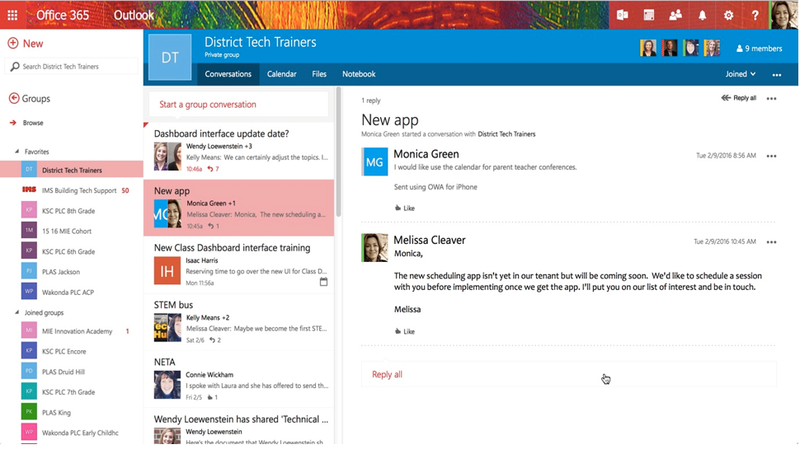 For more information, see this Microsoft in the Classroom session on Office 365 Groups. A Professional Learning Community, or PLC, is a group of educators who meet regularly to share expertise and work collaboratively to improve teaching skills and the academic performance of students. 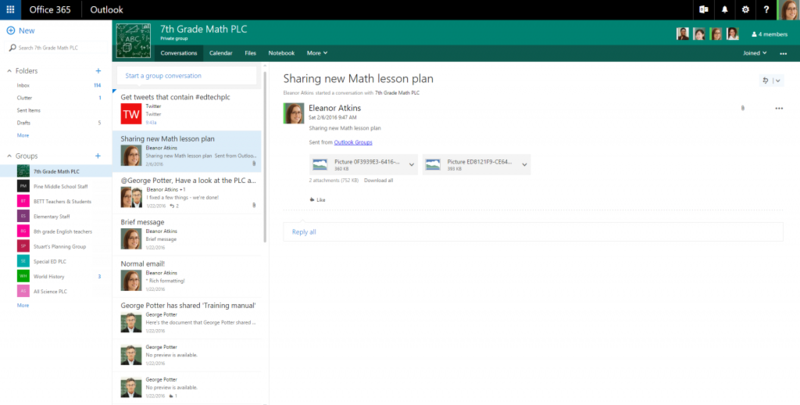 Teachers around the world have started using Office 365 Groups to make collaboration within a PLC a lot simpler and more streamlined. PLC groups are typically formed around interest areas (e.g. 7th-grade Math), grade levels (e.g. 10th-grade teachers) or across subjects (e.g. Science teachers). 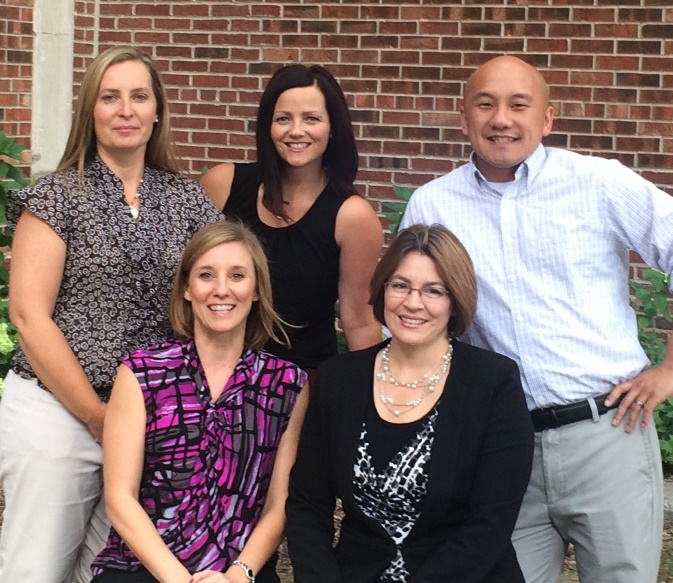 The PLC Office 365 Group collaborates in a rich, familiar conversation space and creates an actionable plan. 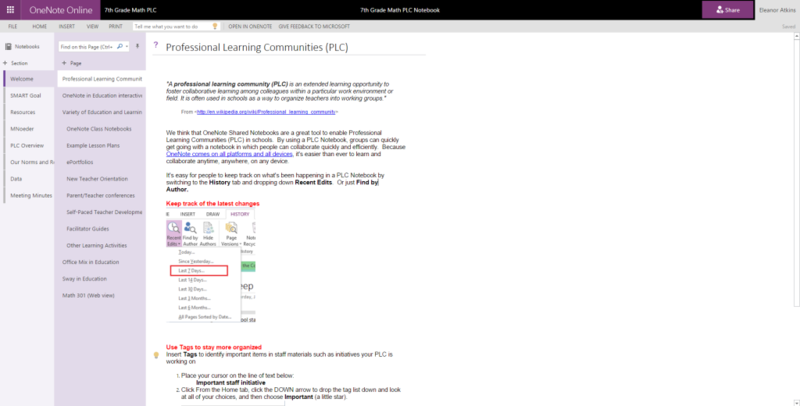 The PLC Office 365 Group collaborates, shares lesson plans and stores student data all in a shared group notebook. PLC Office 365 Group stores reference material in the group’s shared file space. In addition to PLCs, we have seen other scenarios at schools across the globe. 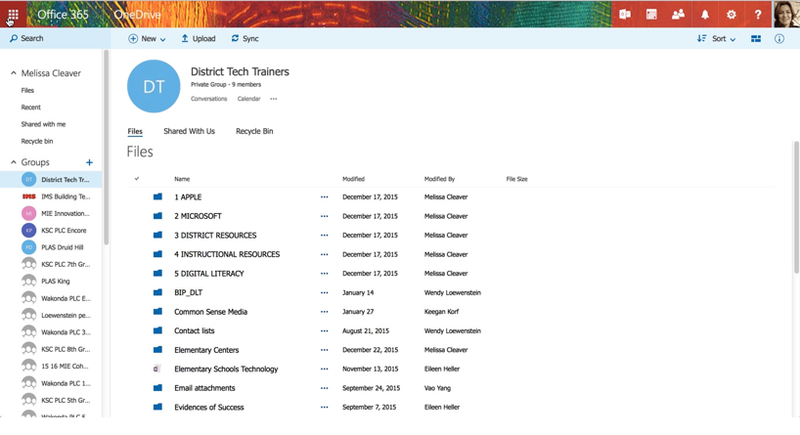 Technology teams in districts like Omaha Public Schools have found great benefit organizing their team with Office 365 Groups. 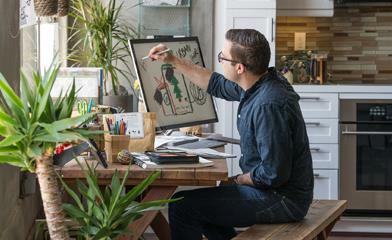 The Office 365 Groups calendar makes meetings more effective. 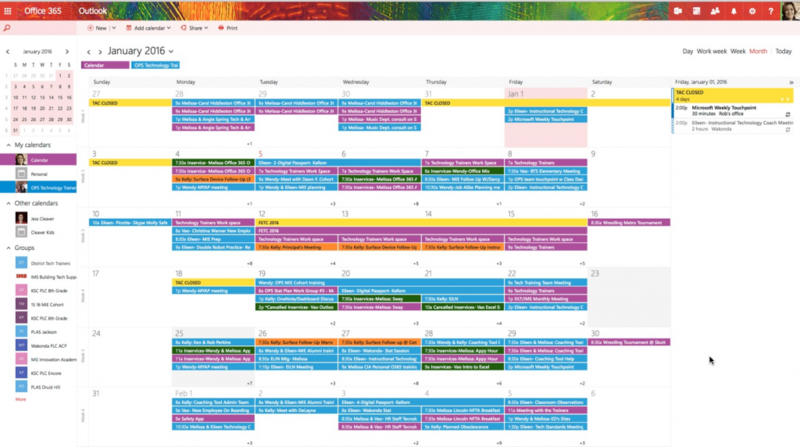 Use of color-coding and naming conventions to organize the five-person team’s training events and meetings made group meeting easy. Group conversation to share articles as well as field training requests from principals and teachers in buildings. Group file space has made organizing files much easier. Students are using Office 365 Groups for a variety of purposes. They feel it is very easy to ask questions and share reference materials all in one place. Support project work, such as classroom group work. Keep up with interest groups like card games and robotics. Manage school clubs like anime club or basketball club. Coordinate big events such as a school dance. Professors have found great use of Office 365 Groups for classroom collaboration since it offers a number of benefits compared to traditional distribution lists. For instance, when a student joins a group, they have full context and history of all class-related discussions, announcements and content shared to date. Similar to schools, students in the universities are also using groups for project work, planning events (e.g. book sale at the university), collaborating on specific interests (e.g. college hikers) and leveraging all the key group resources (conversations, files, calendar and notebook) effectively. Coming soon to enable new Office 365 Groups scenarios! 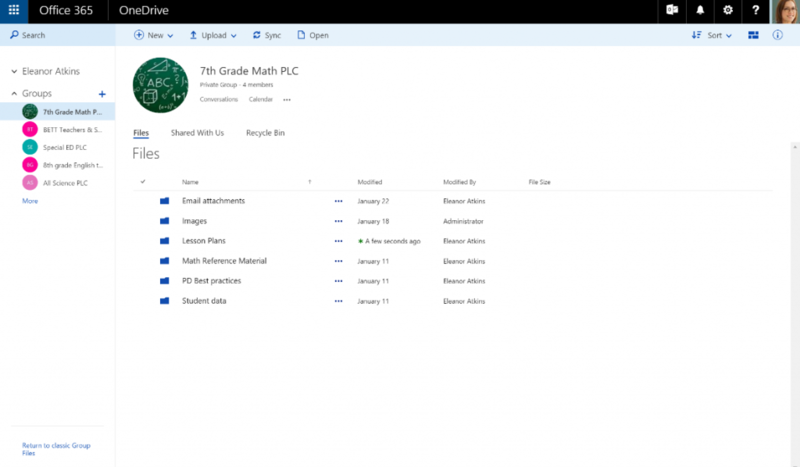 Office 365 Planner—With new Office 365 Planner (currently in Preview) Staff or PLC groups will be able to create actionable plans and student groups will able to organize their projects and course work. Guest access—Faculty in schools and universities will be able to invite users outside their districts/universities as guests to the group. This will help save teachers time on parent communication/coordination. In a PTA group, teachers will be able to engage/communicate instantly with one or more class parents about field trip activities, coordinate PTA conferences and volunteer sign-ups all in one place. Connectors—With Office 365 Connectors, groups will soon be able to connect to various external apps. For example, staff and PLC groups will be able to connect to a school Twitter handle or follow specific PLC topics (e.g. #edtechPLC) right inside the group. For more information about upcoming improvements to Office 365 Groups, please visit fasttrack.office.com/roadmap. Q. Can I enable Office 365 Groups creation for staff or selected users in my district/university? A. Yes, IT admins can enable Office 365 Groups creation for selected users or staff. More details can be found here. Q. How can I prevent a group from reserving important names/aliases? A. IT admins can create group naming policies from either the Office 365 admin center or PowerShell cmdlet. Once configured, these policies apply to both the group display name and email address (alias). More details can be found here. Q. How can I audit/monitor groups created in my school/district? A. With the Groups auditing feature, IT admins can monitor group events. More details can be found here. Q. Can I enable “Send-As” for Office 365 Groups? A. IT admins can now enable the “Send-As” group feature. This is necessarily helpful for inter-department or any outbound communication where you want to send as a group and not an individual. More details can be found here. Q. How can I hide class rosters from others who are not part of the class group? A. IT admins will soon be able to hide membership of the class from other students and staff in school. More details can be found here. Q. How can I enable group creation in specific domains (e.g. student groups in a student domain and faculty groups in a faculty domain)? A. IT admins will soon be able configure policies that allow group creation in specific domains. More details can be found here. Q. My department has a private group and I want to restrict email communication to the group from non-members? A. IT admins can set “AcceptMessagesOnlyFromSendersOrMember” using Set-unifiedgroup to restrict communication to group members. More details can be found here.